(Originally posted on Activating TOK) Yes, of course, we do know that people perceive colours differently. But so very differently? The dress at the centre of this week’s media storm makes an entertaining example in TOK of variability in sense perception, interpretation of optical illusion, and the extreme edge of “shared knowledge” – knowledge claims not shared through communal and corrective methodology but instead spread swiftly through social media. 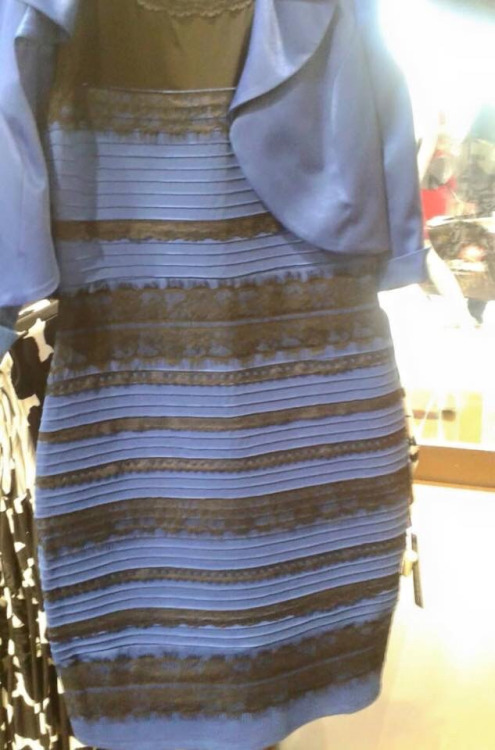 Millions of people are firm in their conflicting knowledge claims: “It’s obviously blue and black!” “Are you kidding? It’s white and gold! Reliable word has it that the off-line dress is, in fact (What a lovely and questionable expression “in fact” is!) blue and black. However, an article in Wired, The Science of Why No One Agrees on the Colour of This Dress, brings the conflicting interpretations directly into the TOK realm of sense perception as a way of knowing: “This fight is about more than just social media—it’s about primal biology and the way human eyes and brains have evolved to see color in a sunlit world.” To understand the differences in interpretation, we have to consider the biology of the eye, features of the object being observed, the parts of it to which we direct attention, and its background context of detail and lighting. Go, TOK, go.